Vertere's philosophy is simple and straightforward. It's based on the fact that any hi-fi system is only as good as its weakest link. In many years of research, Vertere has applied a methodical approach to analyze system performance. 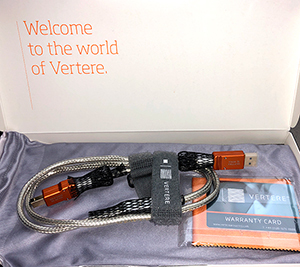 Since 2006, with the introduction of its original Hand-Built Pulse, Vertere has continued to demonstrate conclusively that for almost any system, the weakest link is the connecting cables. Based on Pulse-HB Technology the Hand-built USB utilizes a proprietary shielded data conductor pair and a shield wrapped power conductor which together are then overall shield braided and outer jacketed to produce this amazing USB cable. Every Pulse Hand-built USB cable is meticulously tested and listened with against the original master reference cable to ensure the best performance from computer audio. Click the image at the right for literature of Vertere Cables.